In the study, researchers from the University of Missouri surveyed 121 elementary school teachers, asking questions such as, “How stressful is your job?” and “How well are you coping with the stress of your job right now?” Teachers reported on their levels of burnout and cynicism and on feelings of accomplishment and self-efficacy—their belief in their ability to be effective teachers. Researchers then collected student data that included, among other things, test scores and rates of behavioral problems the teachers observed in the classroom, to gain a sense of how students might be affected by the stress their teachers experience. The researchers rated 7 percent of teachers as “well-adjusted,” with low levels of stress, high levels of coping, and low levels of burnout. 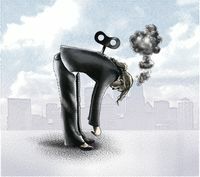 The rest of the teachers were identified as experiencing high levels of stress: 60 percent of study participants were rated by the researchers as “high coping/low burnout,” 30 percent were rated as “moderate coping and burnout,” and 3 percent were rated as “low coping/high burnout”—their high stress, coupled with low coping ability and a lack of support, led to high burnout levels. Teacher stress is high partly because the demands of the job can lead to emotional exhaustion, which arises as teachers try to manage the emotional needs of their students in addition to their academic needs. Not all students come to school ready to learn, and distracted or disruptive students can quickly drain a teacher’s emotional energy. According to a 2013 report, 40 percent of new teachers don’t feel adequately prepared to handle classroom management or discipline issues, and both new and experienced teachers identified classroom management as “the top problem” they struggle with. And when students need high levels of emotional support, teachers are at risk of experiencing vicarious trauma, the so-called “cost of caring” they pay when a student shares his or her traumatic experiences. Chronic levels of emotional exhaustion can leave teachers feeling more isolated at school and believing that they’re less effective in their classrooms than they could be. “When teachers are stressed and not coping well, the relationships they have with students are likely to suffer, leading to negative academic and behavioral outcomes for students,” Herman and his colleagues note. Teachers with high stress and a moderate or low ability to cope with it—33 percent of the study population—reported higher rates of student behavior problems like being disruptive in class or not paying attention than did their colleagues in the well-adjusted group. And the most at-risk group of teachers—the 3 percent who were low coping/high burnout—were also associated with lower student math scores. So when teacher well-being isn’t supported, neither is the well-being of their students—the two are linked. Although most teachers in the study said that their job was demanding, schools can play a vital role in helping teachers deal with stress, the researchers contend. A majority of study participants—60 percent—experienced stress but were able to avoid burnout with proper support from their schools. These teachers experienced better mental and physical health, and their students showed the same level of academic and behavioral outcomes as peers with teachers in the well-adjusted group. By investing in support services and promoting the emotional well-being of teachers, schools can reduce the risk of burnout and the “invisible problem” of teacher turnover—16 percent of teachers in the U.S. change schools or leave the profession each year. Provide support services, such as stress management workshops or relaxation training, which help teachers learn coping strategies. Provide proactive screening, which helps catch early warning signs of burnout. Linking such screenings to events such as Mental Health Awareness Month (May) could increase participation. Foster a positive school culture, which can help buffer against many of the cultural and political sources of stress. Teachers often shoulder the burden of student success, taking criticism for low test scores that is leveled without regard to how limited their classroom resources are. A nurturing environment at school, built upon positive relationships among students and teachers, can decrease feelings of isolation while promoting teacher well-being. The takeaway: To help students succeed, don’t ignore the well-being of teachers. Although stress levels may be high, the right support can help teachers be effective in the classroom.